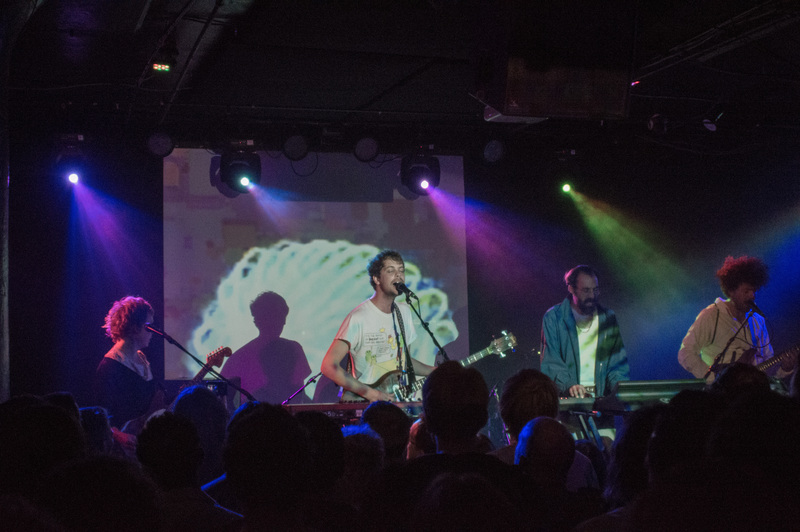 Pond, psychedelic rockers from Perth, Australia, stopped by Underground Arts as part of a short US tour following a tour in South America. Nick Allbrook, lead singer of the band, gave WQHS some behind-the-scenes insight in an interview prior to the show. Sharing DNA with Tame Impala (frontman Nick Allbrook was a member of Tame Impala until 2013 and multi-instrumentalist Jay Watson is a member of both bands), the band started getting more attention after the release of their album Frond and an 8-show spell at SXSW in 2012. It’s the first cold night this fall, and coats are piled up on the barricade, flung over the edge of the stage, and tied around waists and shoulders. The show turns sweaty quickly, and Pond’s weighty guitar riffs seem to have their own gravitational pull as heads nod fiercely to their rhythms. Like a puppet master, Allbrook commands the crowd, wading through rows of fans as people clamor to approach him and reach a hand towards the stage in an effort to be physically closer to the music. Projections flash on a hanging screen, the shifting and spinning patterns casting gentle light on the band’s faces. Jamie Terry on keys takes off his jacket, his white tank top becoming a canvas for pink and yellow geometric projections. Someone tries to crowd surf, the sparse crowd supporting him for a minute before he crashes to the floor. A fight breaks out in the front row, ending with a bystander being punched and the offender being ejected from the venue. Missing Pond’s performance is a high price to pay (albeit fair) for a punch to a stranger. “I know everyone always does the encore,” he says, rolling his eyes caked with dark eyeshadow. “So, we’ll just call this the repriiiise,” he drawls, slinging his guitar strap over his shoulder. They play “Don’t Look at the Sun or You’ll Go Blind.” It makes me wonder which songs were born out of momentary genius, lightning strikes of musical creativity, and which were the product of hard work and constant refining.